Paul Pogba celebrates scoring Juventus' first goal against Torino. Juan Cuadrado came on as a substitute and scored his first Serie A goal of the season at the death to earn struggling Juventus a 2-1 victory over Torino in Saturday’s derby della Molle. With the game looking as if it would end in a draw, Juve’s Leonardo Bonucci saw his header hit the crossbar and moments later Chelsea’s on-loan winger Cuadrado tapped in substitute Alex Sandro’s cross to earn Juve three points. Torino defender Cesare Bovo had scored his first Serie A goal since May 2011 to cancel out Paul Pogba’s opener six minutes into the second half. The win at is Juve’s fourth of the domestic campaign and has lifted the Bianconeri above Torino into 10th place. Juve coach Massimiliano Allegri was searching for answers after his side’s 1-0 defeat at Sassuolo on Wednesday, a result that left them 11 points adrift of Serie A leaders Roma. Toro, who had not been above Juve in the standings after 10 rounds for 31 years, were looking for their first win since September 27. The hosts, without suspended defender Giorgio Chiellini, suffered a setback in the ninth minute when Sami Khedira sustained an apparent calf strain and was replaced by Cuadrado. Former Juve forward Fabio Quagliarella, whose goal earned Toro a 2-1 win against Juve back in April to secure their first Turin derby victory for 20 years, then nearly put the visitors ahead. He was fed by Bovo in the box but his right-footed shot found the side-netting. Juve went ahead in the 19th minute when Cuadrado’s pass found Pogba outside the area and the French midfielder saw his 25-yard volley bounce off the underside of the bar and beat Toro goalkeeper Daniele Padelli. It was Pogba’s second league goal of the season. In the 30th minute, Quagliarella found space just outside the area and struck a right-footed shot that went wide. At the other end, Paulo Dybala’s left-footed attempt went over the bar. Toro almost equalized before the interval but Quagliarella’s goal-bound strike was blocked by Andrea Barzagli. 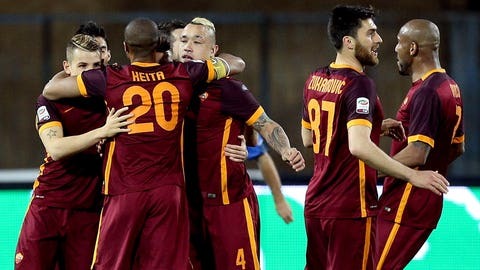 The Granata increased the pressure after the restart and pulled level in the 51st minute. Bovo’s free-kick hit team-mate Daniele Baselli but the defender was first to the rebound and he hit a left-bullet strike from 25 yards past helpless Juve goalkeeper Gianluigi Buffon. Toro almost took the lead in the 57th minute but Buffon made a great save to clear Kamil Glik’s powerful header following a corner. Juve could have gone back in front one minute later when Dybala sent Pogba through on goal but the Frenchman saw Padelli keep out his his close-range strike. In the 70th minute, Giuseppe Vives warmed the hands of Buffon with a hard drive from 30 yards. With the Granata beginning to look more dangerous, Buffon made a goal-line clearance from Glik’s powerful header. With 12 minutes remaining, Allegri brought on Mario Mandzukic in place of Alvaro Morata, hoping to spark his team. Juve reacted and could not believe their luck in stoppage time when Bonucci’s header from Hernanes’ free-kick struck the woodwork with Padelli already beaten. However, they found the back of the net seconds later when Cuadrado beat his marker and struck the ball from five yards past Padelli.